The Central Reserve Police Force said the blast took place when a CRPF convoy was on the move on the highway. Police said earlier that the car driver, the lone occupant, appeared to have escaped. 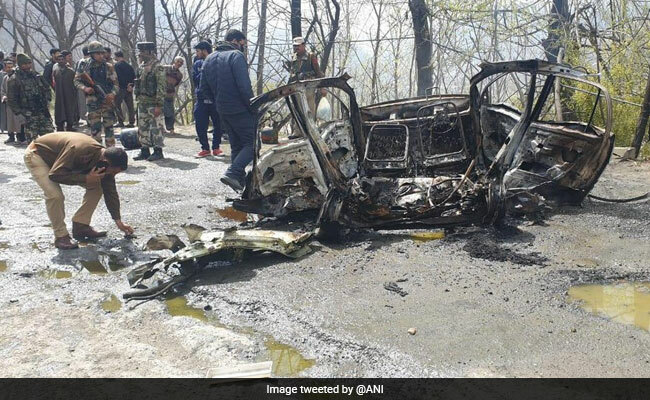 An explosion took place inside a car on the Jammu-Srinagar highway in Jammu and Kashmir's Banihal district on Saturday, sparking panic and slightly damaging one of the CRPF vehicles moving as part of a convoy, authorities said. The police said the explosion occurred inside a private car at Tethar around 10.30 am, destroying the vehicle. The Central Reserve Police Force (CRPF) said the blast took place when a CRPF convoy was on the move on the highway. "The car caught fire and slight damage was caused to the rear of one of the CRPF vehicles. No injuries were caused to CRPF personnel. The incident is being investigated," the CRPF said in a statement. On February 14, a suicide bomber devastated a CRPF vehicle at Pulwama, killing 40 troopers. The attack was claimed by the Pakistan-based Jaish-e-Mohammed (JeM) terrorist group. Authorities had then decided not to allow any civilian vehicular movement on the highway when convoys of the Army and security forces move on it. It wasn't clear how the car came on to the highway when the CRPF convoy was on the move on Saturday.